KitMonsters – Of Verona. The music makers’ guide to making music. Of Verona make attention-grabbing dark futuristic electro-rock and they’ve been getting fantastic reviews for their debut album The White Apple. 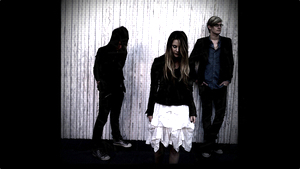 The band - Dillon Pace, Jeff Sojka and hugely powerful singer Mandi Perkins - are known for their “tsunami of sound” when they play live, and have captured fans all over, as well as impressing MTV and iTunes. 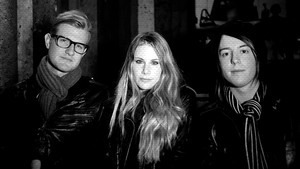 The lead single off their album is ‘Castles’ and has been featured on US radio and on rotation on MTVU. We caught up with Of Verona at the packed first venue of their UK tour and asked them about their sound and their inspiration. Mandi described the style that’s been winning them fans worldwide. It’s an amalgamation of different genres, so it’s really hard to describe an actual sound for us. But the closest thing is futuristic rock. Blended with electronic indie and a little bit of trip pop. A couple of people said we were like trippy, kind of trippy pop and I liked that. So we’ve adopted it as our own. We’re hugely influenced by other artists, especially left of centre ones, and then put our own spin on it and create our own meaning, and that’s Of Verona. Of Verona’s debut album, The White Apple, has been getting great reviews, and there are plenty of exciting things coming up for the band. It’s getting radio play in a bunch of different countries, so we’re fired up about that and we’re going to go in the studio in about three weeks after we get back from the UK and finish up a few more songs - we have a lot planned. And just keep playing. We have syncs coming up on TV and film, so that’s very exciting for us, and keep writing and trying to just take it to the next level and not be complacent with where we are. And just try to get our album heard. 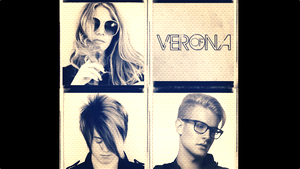 Of Verona told us that a wide range of bands and genres have inspired them. We’ve been hugely influenced by a lot of artists, especially those in the UK, from the 60s and 70s, like Pink Floyd and Bowie, left of centre artists like Björk, and then bands like Garbage, Butch Vig (Nirvana’s producer) producers like that. Drummer Jeff is also very into the dance scene and that filters into Of Verona’s sound too. So that’s how we get a bit of a retro sound with the hard beat of today. It’s a mix of all we love. Mandi loves singers who throw everything into their performance. I think I’m inspired by singers that just have really cool tones and unique ways of presenting their vocals. There’s something to be said for a singer that’s classically trained, that’s beautiful and on point, and always perfectly on key and can have control and everything, then there’s another thing that a singer can do that, but then has an abandon and a wildness and a freedom. I love singers where it comes from the heart, like Stevie Nicks or Janis Joplin. And I’m super into tone. I love a clear beautiful tone, something that sounds real and honest and truthful. That’s what I’m inspired by. Of Verona create their songs in many different ways - we asked them to tell us about how they work, and the music gear they like to use. Song-writing is a very organic process for the band. Well all the songs happen in a different way, sometimes Dillon will play something and then I’d be feeling something that day and I would sing over it, or I would have a lot of lyrical ideas that I would bring in. It’s a very honest album, the songs are all real, we didn’t ever just sit down and say, hey let’s write a song about going to the club and dancing and picking up chicks. Although there’s nothing wrong with those types of songs that’s not our music. Our music’s very honest. Some of it is also about looking in retrospect at stuff that’s happened in the past, and making sense of it. They each have their own take too, on what instruments they write on, says Jeff. Well it’s always different, I mean usually, it could be anything from a piano to some weird string sample, so really anything that strikes some kind of feeling. Mandi says that Dillon does a lot of the producing and there are lots of experiments and happy accidents along the way. Some of the early tryouts have ended up on The White Apple and she describes him as a bit of a magician. A lot of the songs on our debut album are the demos because we couldn’t go back and recreate them or fix them or change them. Because he didn’t remember how we had created what we had created. So I’m thinking that’s a very funny question to ask, how the songs began and how they ended, because no one knows. They just actually happened. Dillon’s a multi-instrumentalist, and plays guitar and keys in their live shows, plus sounds from his computer. I’m running my guitar through a Line 6 POD HD and that’s been amazing, we just went into Line 6 headquarters and picked one up. I’m running all my sounds off of a MacBook with MainStage, it’s got everything in there that I need. Then the Gibson guitar, love Gibson. 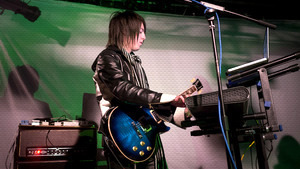 Dillon also uses an M-Audio Axiom 61 keyboard MIDI controller. Jeff talked us through his set up, and the way they organise their live material. The tracks on the songs are usually done kind of in the box, in Logic, and we’ll record drums and stuff like that, but a lot of the guitar tones and a lot of the stuff, we just do all ourselves. Then we take that and just use MainStage for live. It works out really well using Logic and MainStage. Sometimes Jeff will run Ableton Live and split what he describes as bringing the ‘synthetic’ elements of the show, with Dillon. Jeff uses Paiste cymbals and Battlefield Drums. Mandi is a huge fan of the latest technology that means she can record while they are travelling. Blue Mic, who are awesome, gave us a mic each for iPhone, you can plug in and use that. They also gave us a portable Yeti, so I’ve been doing a lot of vocals, I’ll sing into that. And then, iPad’s amazing, iPhone’s amazing. Basically I think that Steve Jobs - ‘How can I take over the world?’, was his first question, which he did. And then the second was ‘How can I make life easier for musicians and songwriters?’ All this syncs up together, so you can sing something in your iPhone, or write something on your iPhone and it’s on your iPad, it’s on your computer and in your iCloud. So we’ve been able to create like that and basically do a lot of songwriting on the road. It’s so inspirational being on the road, you just want to get everything as soon as you can see it. And even just writing titles and stuff like that’s been awesome. Essential kit for live includes In-Ear Monitors for the band, from Ultimate Ears, Westone and Sennheiser, plus a Sennheiser e 945 mic for Mandi, and a TC Helicon VoiceLive Touch 2 for signature vocal effects. Check out the band’s kit list for more details.